RC Helicopters are becoming so popular that it attracts many new enthusiasts everyday. Upon getting their hands on this new enjoyable hobby, many beginners become puzzled when they know that RC helicopters come labeled either as "fixed pitched" or "collective pitch". For this reason, many new pilots have come to wonder what exactly the difference between the two is. To understand how these two pitch setups differ, the first step is to come to know what "pitch" means. The "pitch" of a helicopter is the angle of the main rotor blade. Generally, the measurement of this "pitch" angle is done relative to the horizontal plane. Helicopters generate lift by rotating their rotor through the air. 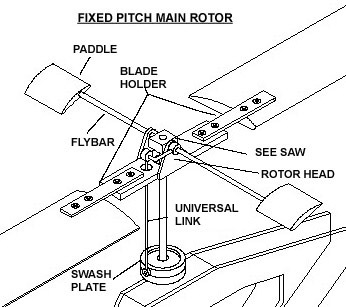 With a fixed pitch helicopter, when the rotor spins faster, more lift is generated and the helicopter ascends. On the other hand, slower rotor rotation generates less lift and the helicopter descends. 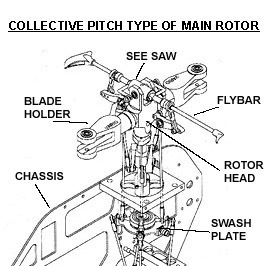 For collective pitch helicopters, the pitch of the blade becomes another factor in the lift generating equation. In this setup, the lift can also be altered by the angle (pitch) in which the main rotor blade is positioned. To put it another way; while to rotor is rotating at a constant speed, the lift generated can be altered by changing the pitch alone. Now that we know the technical difference between the two pitch setups, the next question is: how does it affect my flight? Quite simply, a collective pitch helicopter is more responsive, agile, and smoother to fly. Nevertheless, there is a tradeoff. They are much harder to learn, require a more complicated transmitter, and cost much more than fixed pitched helicopters. They also have more moving parts, which means they break more easily and requires more maintenance. So which one should you choose to fly? Fixed pitch or collective pitch? It all comes down to your own choice and how serious you are with this hobby. A fixed pitch helicopter has fewer moving parts, making it more ideal for beginner as it requires less maintenance. Many also claim that a fixed pitch helicopter is easier to fly (but this claim is often challenged by avid pilots). Also, most of the helicopters that are fixed pitch comes in an RTF (Ready to Fly) set, and usually includes a radio transmitter (which won't work on collective pitch models though). However, if you plan to stay in this hobby for a long time and fly in more demanding ways, then perhaps making a bigger investment and getting a collective pitch helicopter will be worth while. great read, taught me a lot! Excellent article Admin. Thanks for the info. Question. Does the new blade SR give new meaning to collective pitch RTF egg beaters? Interested in any thoughts. Peace all.